Trang Nguyen has done it all: nail tech, salon owner, school instructor, product manufacturer. And because of all this, he has a unique understanding of what nail professionals need in their products. Trang Nguyen has worked in the nail industry for 19 years as a nail technician, top competitor, and school instructor. He worked in California, before moving to Florida, bringing the nail care craze to the East Coast. His high profile on the competition circuit made him an inspiration to many nail techs, and Trang decided to create an exceptional product that could meet the exacting standards of the top competition technicians in the world and work successfully in the busy salon environment. 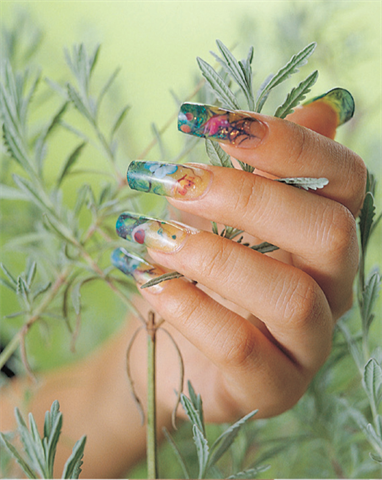 Different formulations were tested, developed, and re-developed over a period of five years until finally Odyssey Nail Systems was launched in 1999. Odyssey Nail Systems is built on the principles of supplying superior products and first-class education that will enable nail professionals to create outstanding results, faster and more efficiently than ever before. Trang’s display case is filled to capacity with trophies won in competitions worldwide, but there is no greater award for him, he says, than knowing his products help nail technicians win the loyalty of their customers. Masterworks founder Amy Becker is happy to be back in the competition arena after a few years off. Where does a top nail competitor get her ideas? In the case of New York City-based nail tech Erina Ogawa, they come from shoes, clothes, furniture, or just her imagination.